Rhythm based video games dominated the world for a few years, back in the late 2000s. The meteoric rise of Guitar Hero led to a whole host of other games trying to get in on the hype. It’s a genre I’m a huge fan of. Starting off on Dance Dance Revolution as a kid, and graduating to learning how to play bass and drums as a teen. 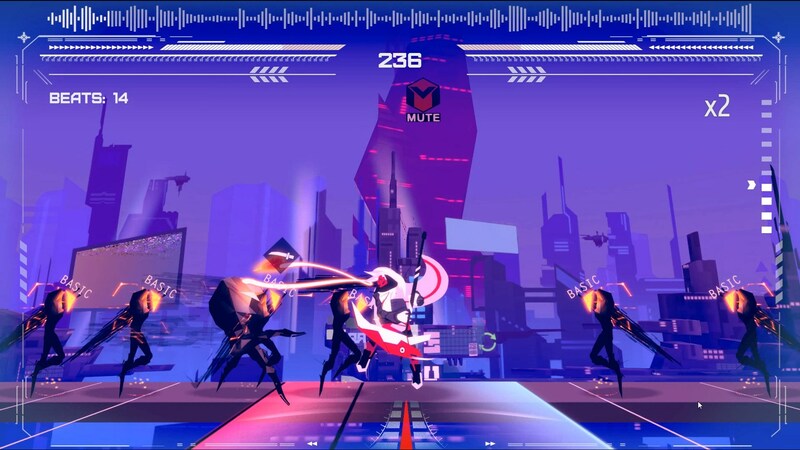 So, along comes a game called TERRORHYTHM (TRRT). It instantly strikes me as an interesting blend of genres. A fusion between the oddly fantastic One Finger Death Punch, and indie darling Crypt of the Necrodancer. What’s not to love here? As it turns out, there’s a lot left to be desired. TRRT doesn’t live up to the expectations I had going in to the game, not even close. The first glaring issue presents itself before you’re even playing; there’s no music on the title screen. In a game within a genre that’s all about cleverly combining music and gameplay, that’s a red alert for me straight from the outset. But I pushed past it. After figuring out how to change the game’s default language away from Russian, I jumped in to the tutorial to learn how to play. I was hoping that the initial bad taste would be washed away by smooth, delicious gameplay. Instead, I got a poorly calibrated experience that seemed to stutter a lot despite me playing on the ‘fastest’ settings. Anyone who’s ever played a rhythm game will tell you that the calibration needs to be on point or the whole game will feel off. So I exited from the tutorial, spent a few minutes calibrating and then tried again. The gameplay itself is an incredibly simple affair. Enemies run at your character from either side. When they enter a highlighted zone next to you, you can press the left or right key in their direction and your character will attack them. The trick is that you need to input your commands in time to the bass-dominated techno music that plays. 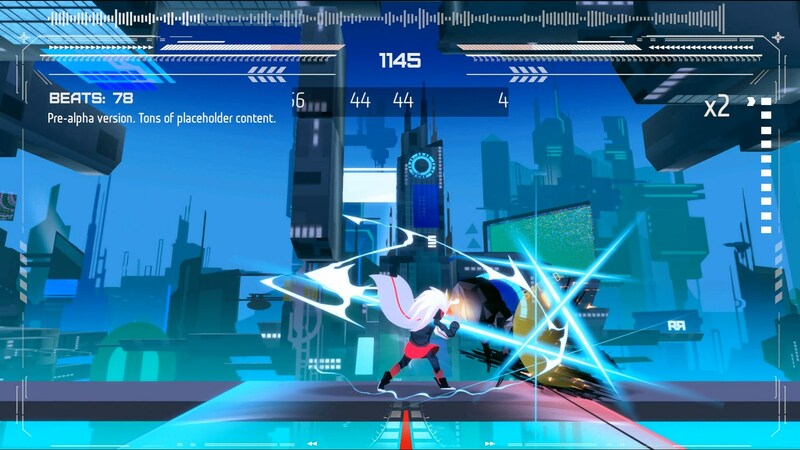 Since there isn’t an enemy coming at you for every beat, you need to be able to fill the gaps between attacks. You can press down to expand the area that you can attack in,or you can press up to empower your next attack so it can hit two enemies at a time. When you put all your options together, you fight in time to the music to defeat wave after wave of opponents. Sadly, despite attempting to calibrate the game repeatedly, I never felt like the actions quite synced up to the music properly. It felt like trying to play the drums a fraction of a beat off time. And that makes for a pretty jarring gameplay experience. Moving on to the games campaign, I selected the first of TRRT’s many neon-infested levels and got down to the proper experience. For a game with such a vivid colour pallet, the various levels of TRRT manage to be as visually generic as the music. The dull drum and bass tracks that play over every level lack any real diversity, even as they increase in tempo. Combined with the garish range of neon coloured yet uninteresting levels, every stage of TRRT presents an assault on the senses. So much so that it causes each level to fail to leave an impression on you as you play. 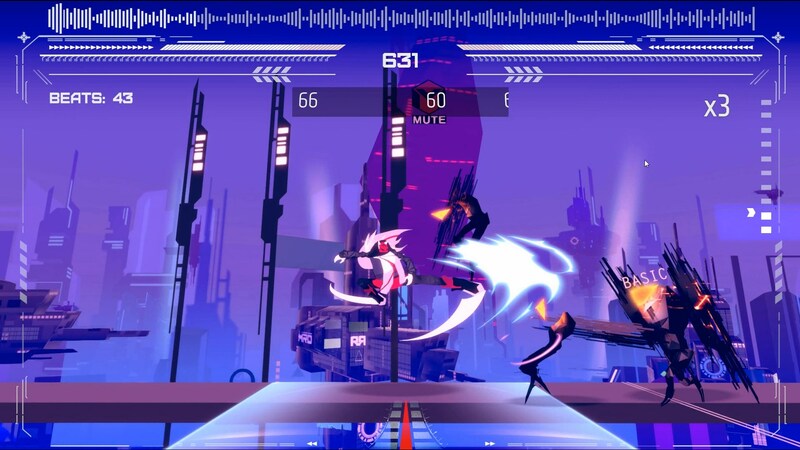 There are no moments that have you saying “damn, this song is fantastic” or “wow, this level looks amazing”. And each level ends in a very odd style for this genre of game. The music quickly fades out into silence, but the enemies keep spawning. So you’re forced to keep fighting in time to a beat that no longer exists. Pressing those keys in ‘time’ to a song that finished a good ten seconds ago feels very awkward. The enemies themselves present a problem as well. While you learn about the different types of enemies in the tutorial, they lack any real visual diversity. At a glance it can be difficult to tell the basic types of enemies apart from one another. Early in the game this isn’t an issue, as the three types of enemies are different enough. Regular enemies die in a single hit. Larger enemies take two hits to bring down. And the shielded enemies will shrug off even your empowered attacks. But then the game introduces ‘Jumpers’. These enemies will respond to your attacks by leaping to the other side of your character, causing you to have to attack them on both sides. Occasionally a single jumper will do this many times. The issue here is that the Jumpers aren’t visually distinct enough to stand out from a large crowd of regular enemies. Especially when you’re playing at higher difficulties or on the faster songs. It can be a bit jarring when, while fighting off a horde of enemies, one of them starts leaping from side to side. One of the most inexplicable issues I had with TRRT’s campaign mode is that, upon finishing a level, there is no ‘Next level’. You had to go back to the campaign menu, choose the next stage you wanted to attempt. Then choose the difficulty you wanted to play on(there are four), and then press start. And then there was often some loading time between each of those actions! TERROHYTHM isn’t a game I can recommend. 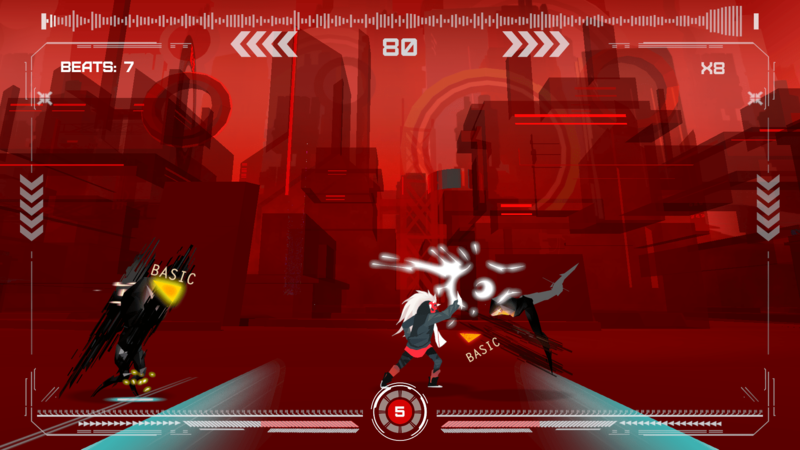 Fans of simplistic combat games like One Finger Death Punch can do better. Rhythm gamers will be instantly turned off by the issues with calibration and the lazy, generic music. TRRT is still in Early Access, so there’s obviously still time for fixes to be put in place that might save the game. But for the moment, this is less ‘Beats by Dr Dre’ and more ‘Beats by Dr Doolittle’.